We got it started! Cough Cough. Blows a little smoke though. Thankfully it clears up somewhat once it's a bit warmer. This is it running after it clears up a little. You can still see a little haze out of the exhaust but it no longer looks like we set off a smoke bomb. You may be wondering what is different to get this engine started to last time? Well it was suggested that we try driving it with a drill and a socket that will go over the crankshaft. That would work and I do have a drill that would be suitable. However I don't have any sockets big enough. It's a piece of rope that I had sitting around here wrapped around a fair few times. With this and someone to flip the decompression once it gets some speed up it's just about always first pull to start. Another thing I like about this is that I feel it's much safer. 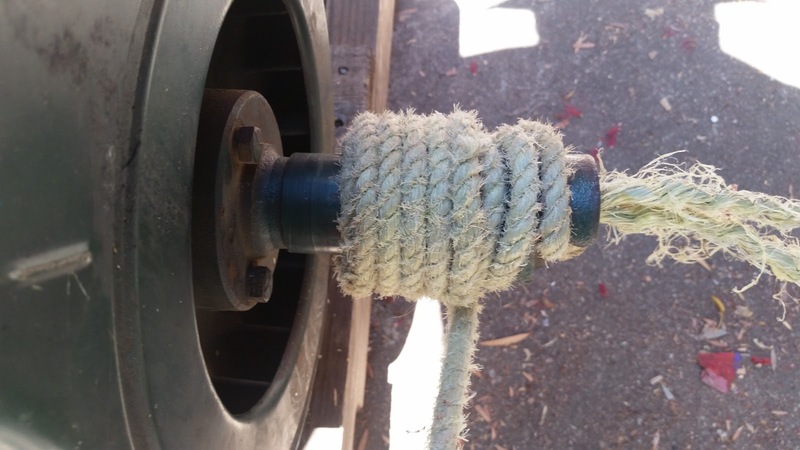 As long as it doesn't get caught around your leg there isn't enough mass in the rope to hurt badly if it were to get thrown at you. Also if it were to get caught and not release then it is light enough that it shouldn't unbalance the engine. Making it a much less stressful process to stop if something goes wrong like that. I have also cut down this rope so it is only about as long as it needs to be. This makes it a lot harder to catch yourself on it or tangle up in any way. 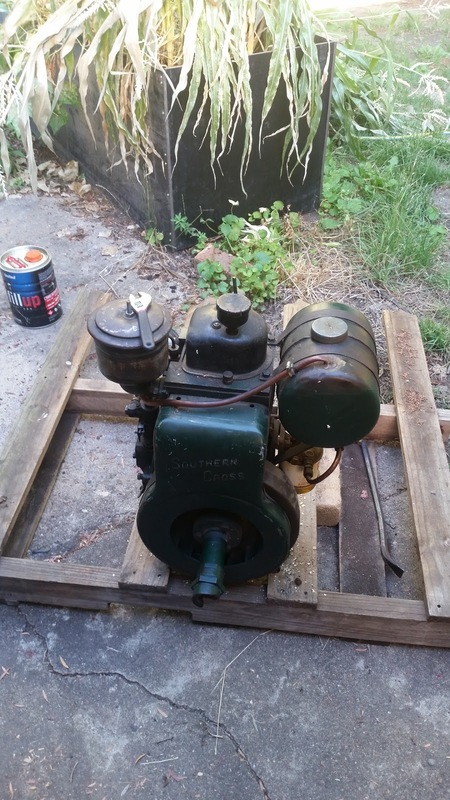 Southern Cross Stationary Engine has us beat. 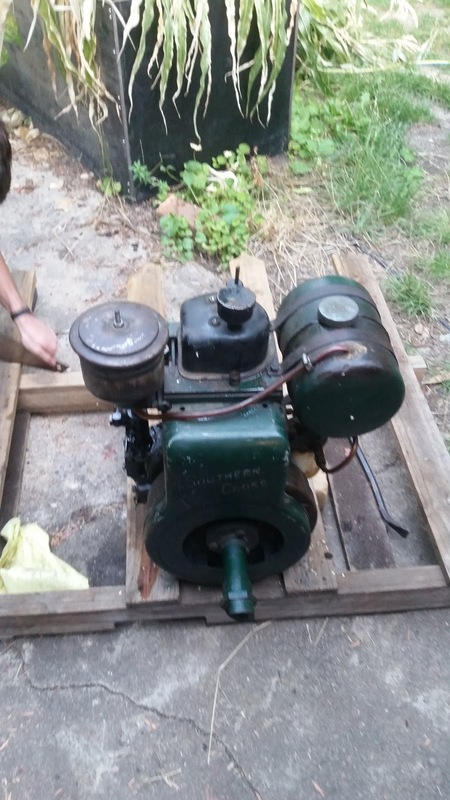 My Brother bought a small stationary engine the other day and has it at my house for now. It is a Southern Cross 3 1/2 HP Diesel model EF-D. I found it on a buy/swap/sell group on Facebook and mentioned it to him. A couple of days later and here it is. 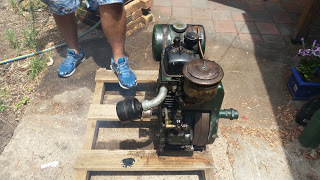 The bloke he bought it from gave us a little instruction on starting it. 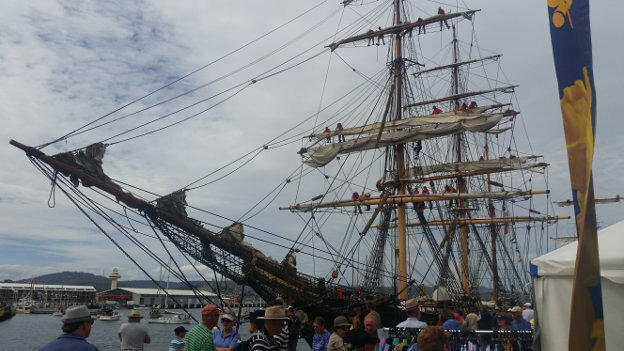 However we were unable to get a demonstration as it didn't have a base at the time. So with a couple of bolts holding it on to an old pallet I had at home the process began. First we tried to bleed the pump. This worked really well, after I opened the correct bleeder valve. At this point diesel started to run out quite fast. 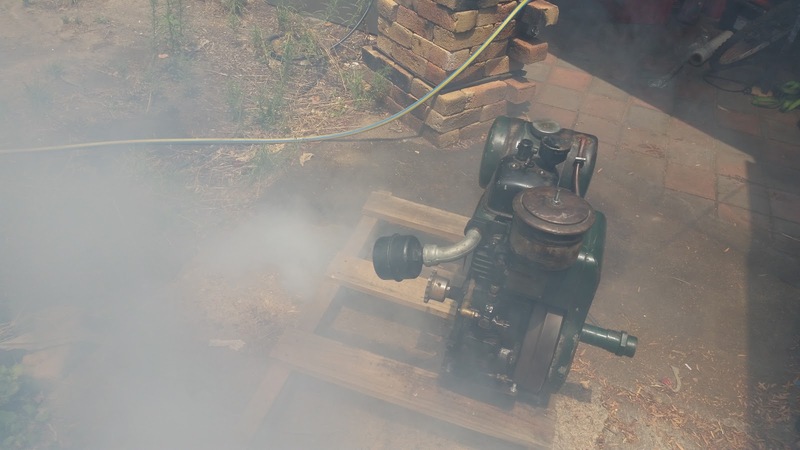 Then bleed the high pressure line to the injector. Crack the nut and pump until fuel comes out without any bubbles. This done we poured oil down the hole we were told to pour it down then time to start it up. 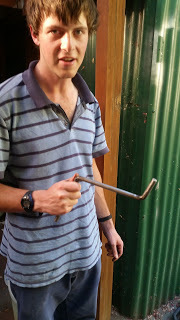 My Brother with the key. No fancy electronic start here. Maybe electronic start isn't such a bad idea. 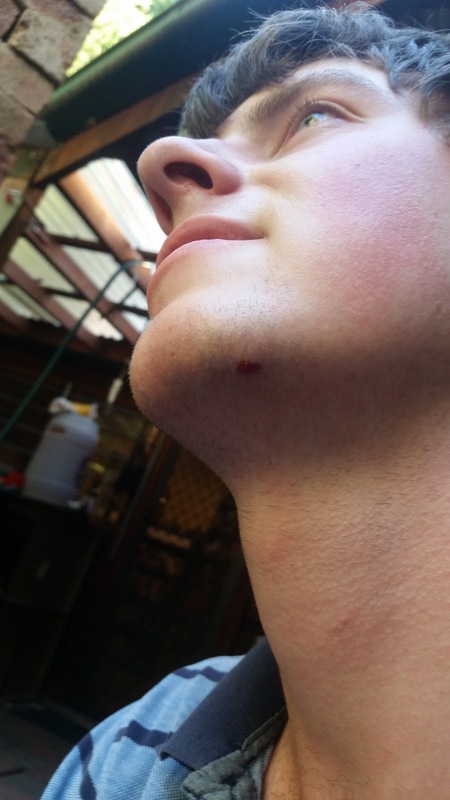 He managed to clonk himself on the knee then the chin. Drawing a little blood. On the safety of starting these engines. The nut that the crank handle engages with has a slope on it so that if the engine starts then it will push the handle out. It will not throw it if you don't let go but it will push it away from the engine. Also some of the similar engines were actually able to run backwards if you didn't get it started right. These ones have had a slight modification to the head to stop them from doing this. 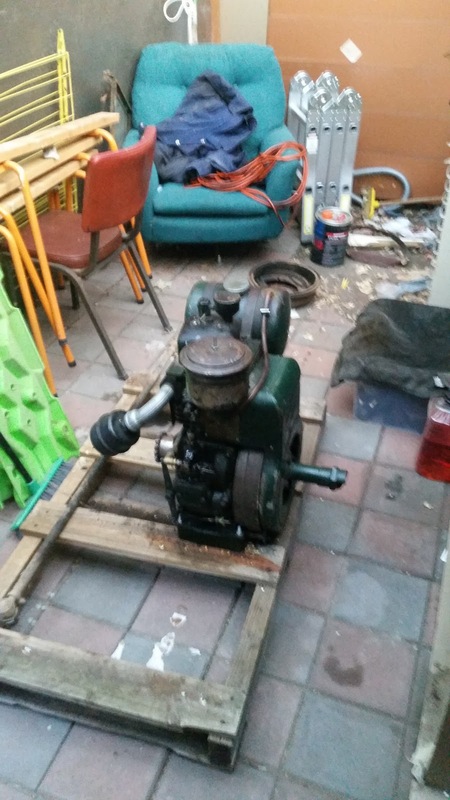 After a little break I decided to have a crank. I managed to get some puffs of smoke out of the exhaust but it never even coughed. Being that we were both worn out we decided it was time to pack up and try another day so here it is sitting in the naughty corner. After this I ended up finding a manual online and discovered that we had the governor set wrong for starting. Hopefully this is what has been causing it to not start and we can start it next time. Tonight was a very significant step forward in the development of the new control system for the Mill. 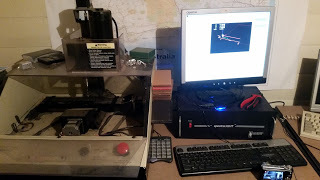 I have now reached a point where I trust the setup enough that I can start finalising the control parameters and start tuning the motors and so on. I wrote a little G-Code program with some help from the Machinekit documentation so I can run some tests that will help me with this tuning. The main thing I am worried about at the moment is loosing steps because of incorrect speeds or acceleration. 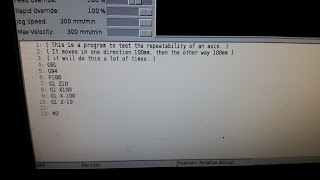 To test this I am going to set up a program that will cycle for about 10min or so just making movements in one axis to see if it drops any steps. If I note it's position when it starts and compare that to the position it returns to then I will know if it has lost any steps. A very basic program so far. It only runs once but all it will be is a replication of this program many times to get the cycles needed for confidence in the setup. This is a video of running this program. It is using a feedrate of 100mm/min which the motors seem to like. So this should be a good starting point that I can improve on. I'm thinking about different ways I can share the programs between different computers. I am probably going to set up a Github or similar account that I can store the machine definitions in. Then if the SD card this is running from dies I still have the configurations and they can easily be transferred to other machines or shared. For the G-Code programs I am probably going to set up a Resilio Sync installation on the controller. This way if I want to edit the files on a different, faster computer I can. Then once I'm finished editing the files it will be quite quick to move across to the controller.